The quality of work, team spirit, honesty and transparency exhibited by the University has been commended by the Project Director, Cassava: Adding Value to Africa (C:AVA), Professor Andrew Westby of the Natural Resources Institute (NRI), United Kingdom. The Project Director gave the commendation at a meeting with the Vice-Chancellor, Professor Olusola Oyewole, at the University when he called to revisit the proposal writing for the second phase of the project. According to the Project Director, the collaboration and support enjoyed from the University translated into the many successes recorded by C:AVA in the areas of developing Cassava SME as well as positively affecting the lives of many African families. Speaking on the development for an African organization to provide institutional leadership, Professor Westby said, “I think it is a step in the right direction to pass leadership to an African organization and I think all of us are supportive of FUNAAB taking that role and C:AVA being the Project Director”. “Sincerely speaking, you have our full support in doing that and I hope that as we have done in the last few years, we can use the collaboration that we have on C:AVA as a building block, to build other things as well”, he added. Responding, the Vice-Chancellor, Professor Oyewole, assured the C:AVA team that the University would not relent in its effort at providing the necessary support to advance the work of the C:AVA project. 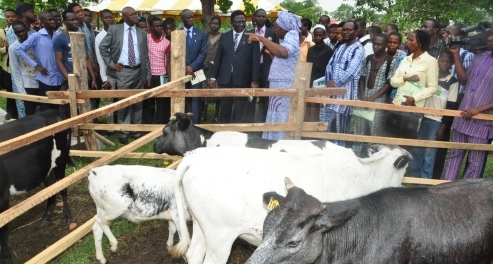 He commended the Nigerian team for turning C:AVA into a national project saying that “C:AVA is now a project that even the Minister of Agriculture now talks about at different fora”. 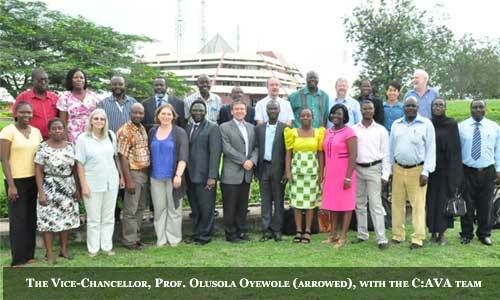 Earlier, the C:AVA Project Manager in Africa, Dr. Kolawole Adebayo, said that as part of the criteria for the C:AVA Project Phase II, FUNAAB was selected to provide institutional leadership after a due diligence exercise was conducted by the foundation and the University was found worthy to be the grantee of the foundation. 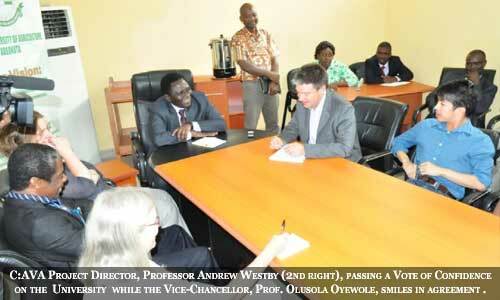 Thus, FUNAAB has been the Country Office of C:AVA since 2008. The Project Manager said that the project is presently at a stage where the proposal for its Phase II is being written, stating that the necessary procedure might extend till December, 2013. The Country Manager, Professor Lateef Sanni, was at the meeting as well as other members from USA, Ghana, UK, Tanzania, Uganda, Malawi and the Netherlands.